This is a simple, low cost, but effective project. 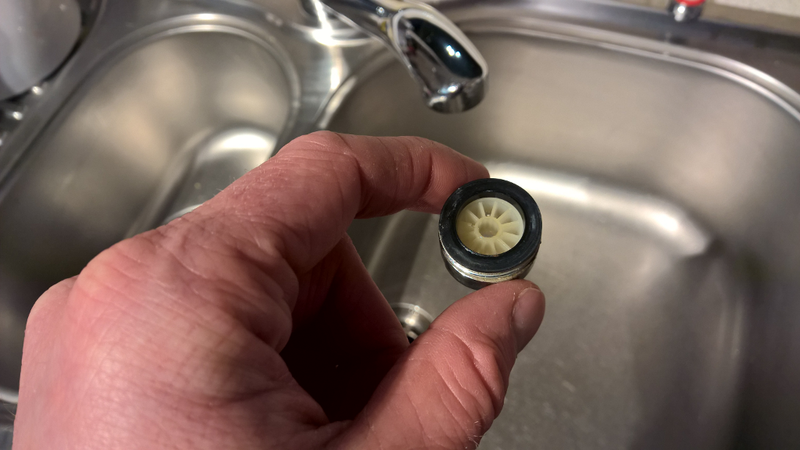 A tap aerator (or faucet aerator) can be screwed onto the faucet head, creating a no-splashing stream and often delivering a mixture of water and air. 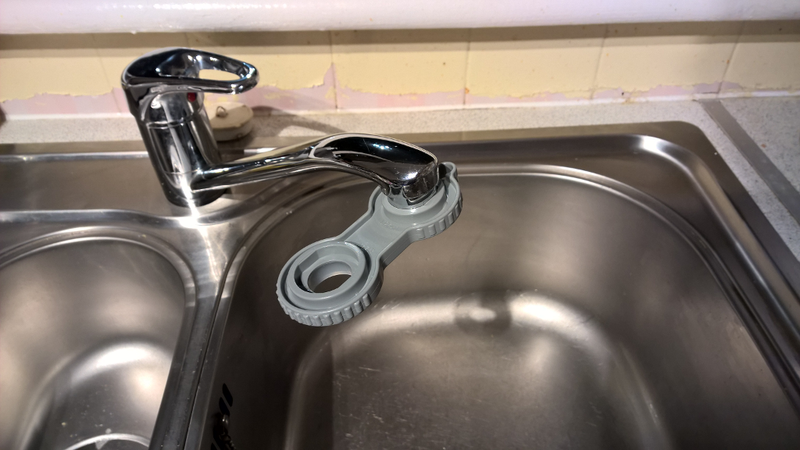 This is quite useful for reducing the amount of water coming out of the faucet without reducing it’s usefulness. 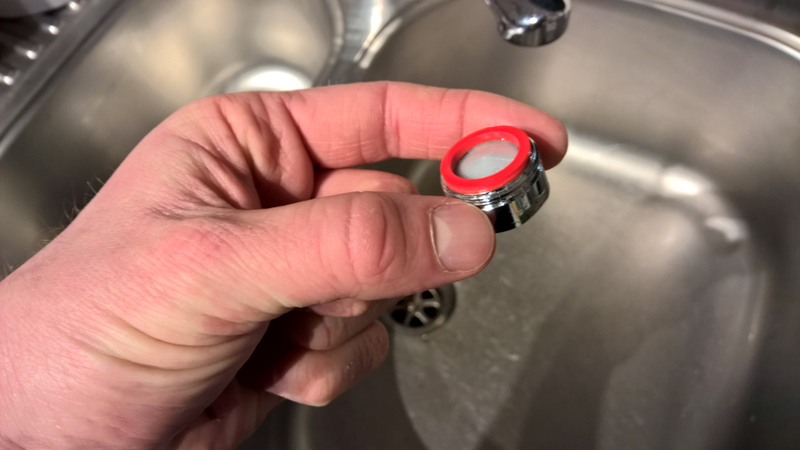 In fact – it actually creates a stream of water which doesn’t splash when it hits objects (such as your hands or implements you’re washing in the sink). 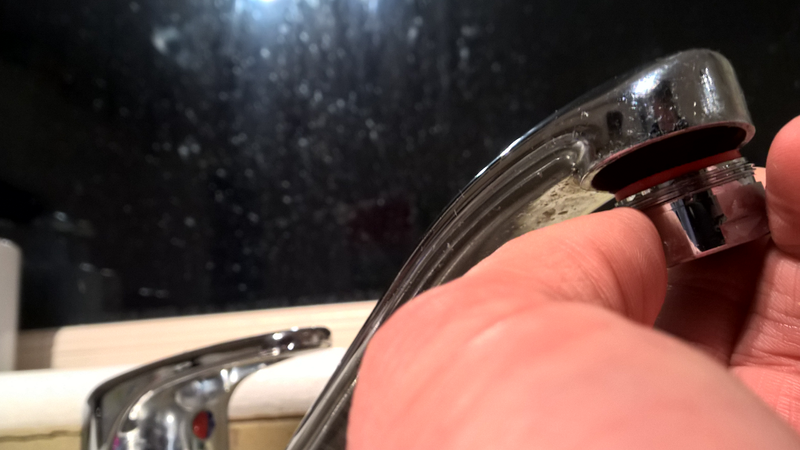 The water doesn’t splash as readily because the air bubbles in the aerated water collapse on contact, which absorbs energy which would otherwise have sent water splashing out of the sink. For €4 and 5 minutes installation, we’re saving 7,966 litres of water a year, which amounts to €63.73 of savings. Payback Period: 0.0628 years. This pays for itself in 23 days! I bought this Aerator set for €4, they are also easy to find cheaply on the internet (here or here). 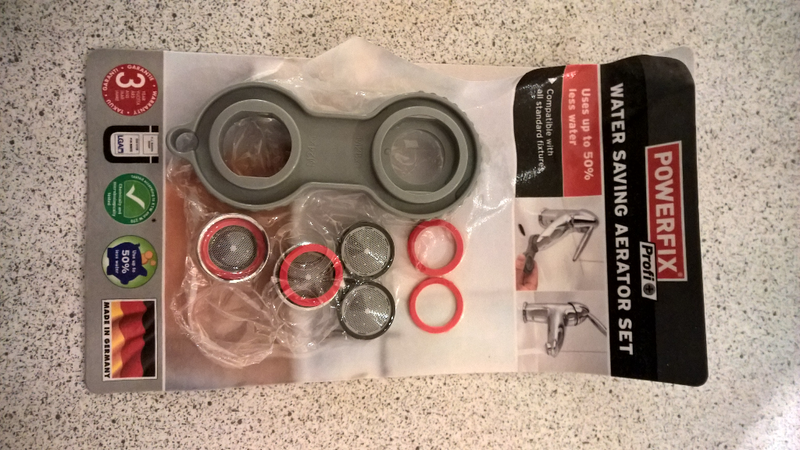 The water saving kit with tap aerators and the tool for changing them (though you can just use a wrench). I also see an interesting Kid’s Water Saving Kit on Amazon with a tap aerator, shower aerator, toilet cistern flush volume reducer and a few other things. That could be pretty good for a fun, educational project with a child. The kit above included a plastic wrench for unscrewing the existing, but actually, a variable sized wrench was more effective, so it’s probably easier and cheaper just to buy the aerator itself. Fitting the aerators are very simple. You unscrew the existing fixing. The flow of water before the aerator. Flow of water after adding the aerator. 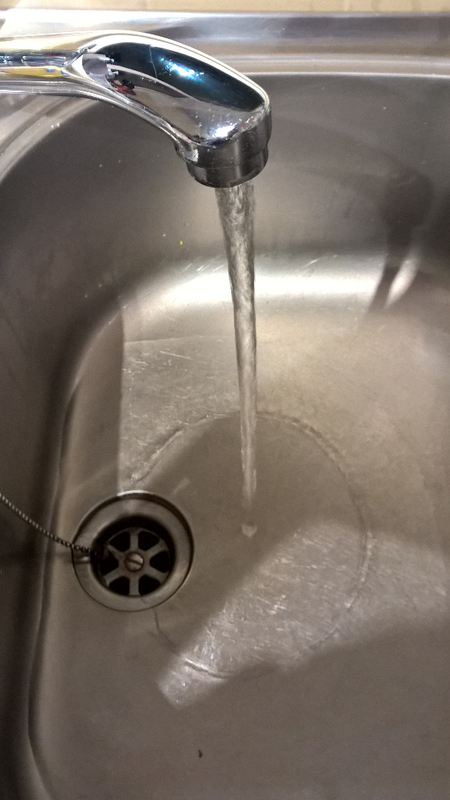 So the yearly saving comes to 18,800 – 10,834 = 7,966 litres of water per year in the kitchen sink. The two bathroom sinks are used about half as much, so if they’re used for 2.5 minutes each day, that means 5 minutes in total between them, so the number will be the same as the kitchen: 7,966 litres of water saved per year. Giving a total saving for the house of 15,932 litres. Energy Saved (kwh): We pay for the energy consumed treating and pumping the water to our house in the cost of the water, so this won’t be a direct saving to us. Nevertheless, I was curious to know the energy saving. 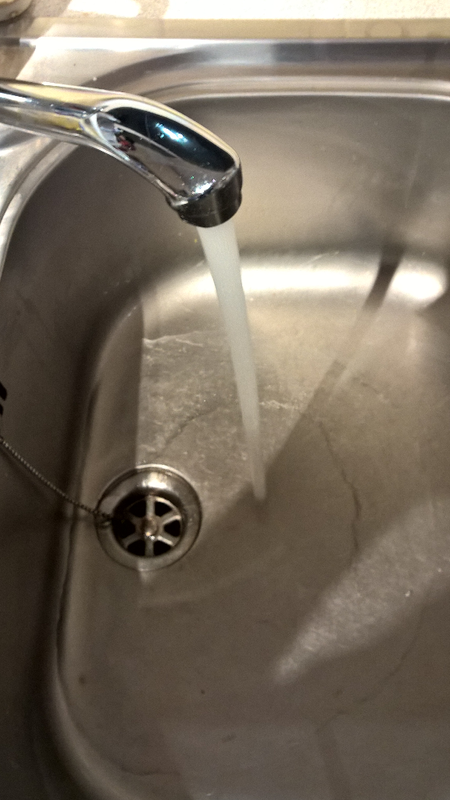 From here, To supply and treat 1m3 of tap water takes around 1.2kWh of electrical energy. There is 1000 litres in 1m^3 of water, so 1 litre emits 1.2 / 1000 = 0.0012kWh. So yearly, saving 15,932 litres, saves 15,932 * 0.0012 = 19.1184 kWh. After use, the water goes into the sewage system and needs to be treated also, which results in a comparable energy consumption, so that brings the total to 19.1184 * 2 = 38kWh per year. Emissions: The grid intensity of Ireland is about 450 gCO2 per kWh. That means saving 15,932 litres of water, which saves 19.1184 kWh per year averts 19.1184 * .450 = 8.6033 kgCO2. After use, the water goes into the sewage system and needs to be treated, which results in 0.781g CO2 per litre (it’s more than just the emissions from the energy generation because waste water treatment also releases methane). So 15,932 litres * 0.781g CO2 per litre = 12,442.892 gramms per year or 12.4 kgCO2. Giving a grand total of 8.6 + 12.4 = 21.0462 kgCO2 per year. Payback Period: 0.0628 years. This pays for itself in23 days! With a ROI of 15,725%, this may well be the best €4 I have ever invested! It makes sense for anyone with €4 to their name to do this immediately. It’s very simple to do – anyone can install tap aerators. Ireland has one of the cheapest water charges per litre in the developed world, so for most other countries, the savings are likely to be higher. Do you ever suffer from scope creep too? I have three taps in the house where I can install these aerators, the others are older style without threads on the outlet. So clearly, I need new taps. If I’m going that far, we should probably upgrade the sink too. Well, we were considering redoing the bathroom in the next 5 years so probably better to do that now then. Suddenly we’ve gone from adding an aerator to remodelling the bathroom and the ensuite! !